When the body sustains an injury, the release of platelets is triggered. Platelets contain growth factors that stimulate a cascade of biological effects to stop bleeding and restore tissue. Normal human blood consists of about 93% red blood cells, 1% white blood cells, and 6% platelets. After blood is drawn and centrifuged according to a specific protocol, plasma with a platelet count of 94% can be isolated. 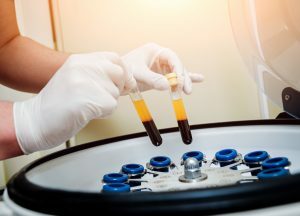 This Platelet Rich Plasma (PRP), also known as liquid gold to dermatologists, has been long used for the treatment of injured tendons, fractures, and chronic wounds. More recently, the regenerative capabilities of PRP have been harnessed for skin rejuvenation, scar remodeling, stretch marks, and hair regrowth. For skin rejuvenation, PRP can be used as a filler, known as the “Vampire Facelift,” to add volume and stimulate collagen formation in areas such as the nasolabial folds, tear troughs, marionette lines, and hands. It can also be used in conjunction with a microneedling pen, known as the “Vampire Facial,” to improve skin texture and decrease the appearance of fine lines. Since it is autologous, meaning it comes from a patient’s own blood, it is 100% natural and there are no described immune or allergic reactions to PRP. Microneedling with PRP can be beneficial in the treatment of acne scars, surgical scars, and stretch marks. Microneedling creates a micro-trauma, which elicits the body’s natural healing response and allows access of the applied PRP into the skin. This stimulates enhanced tissue remodeling with rapid healing and minimal downtime. Since there is no heat involved, microneedling with PRP can be used in all skin types. PRP injections have proven efficacy in the treatment of hair loss. The growth factors released from the activated platelets are thought to awaken dormant hair follicles, improve the blood supply around follicular units, and prolong the active growth phase of hair. PRP injections can be done alone, as mono-therapy, or in combination with other modalities like vitamins, topical minoxidil, and oral finasteride. The beauty of PRP in dermatology is that it takes advantage of the body’s own regenerative ability to treat signs of aging, scarring, skin texture issues, and hair loss. PRP is easily isolated from a routine blood draw. Procedures are low risk, have minimal downtime, and can be utilized in combination with other treatment modalities to enhance results.